I will be at Artist Alley Table C11. One of my favroite things about going to shows is doing Free Sketches. It is a great way to get share my work with new people. 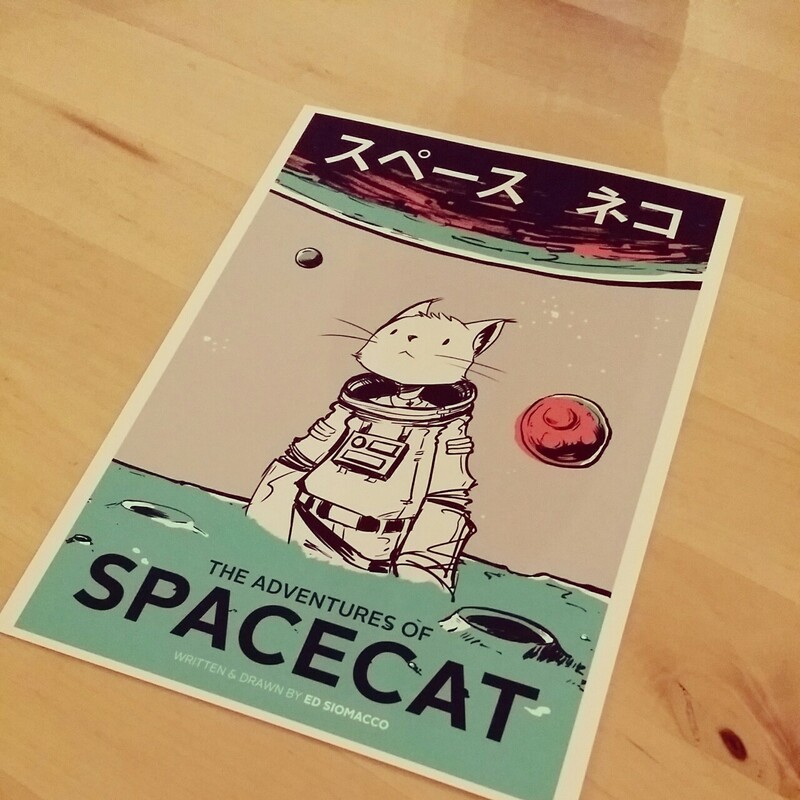 I will be bringing prints of various sizes, my PLASMA sketchbooks, and my ‘The Adventures of SpaceCat’ mini-comics. 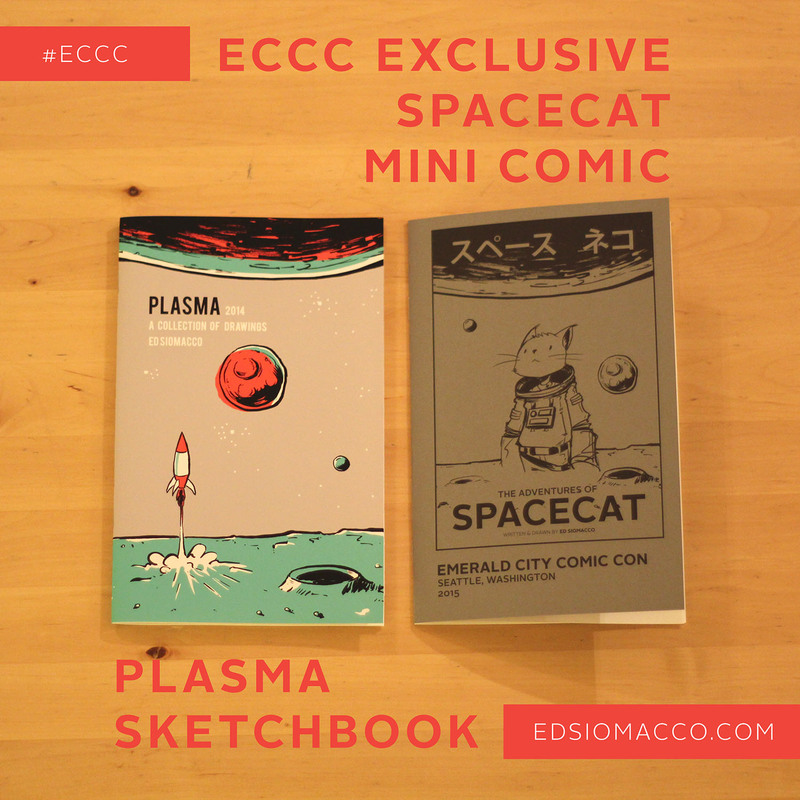 I only have a limited number of copies left of my PLASMA sketchbooks and my SpaceCat mini comics. 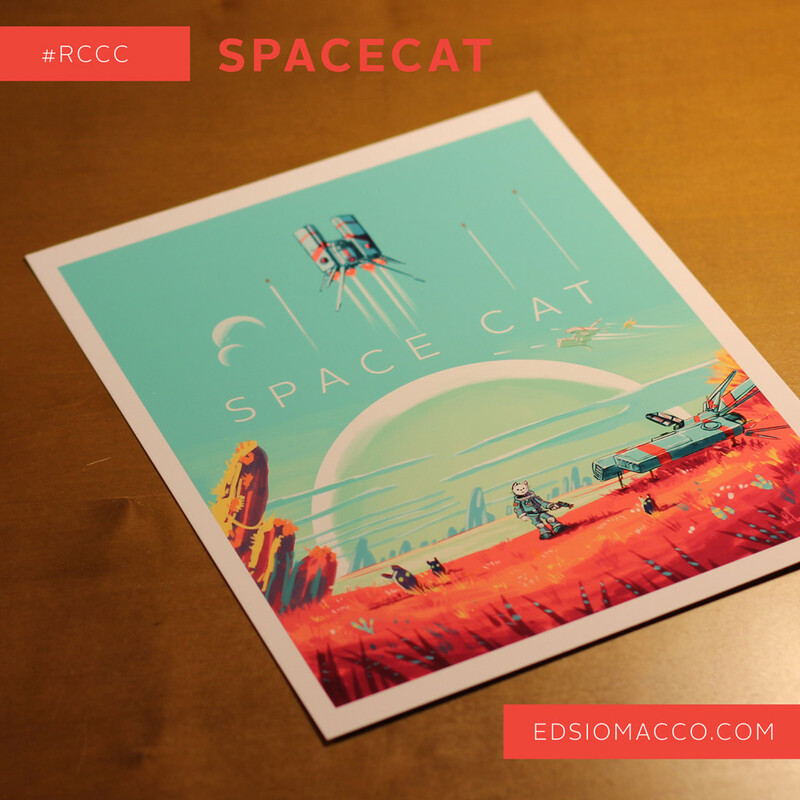 I recently illustrated this No Man’s Sky X SpaceCat fan art mashup. Some people are dissapointed in the game, but the game’s cover art did not dissapoint. 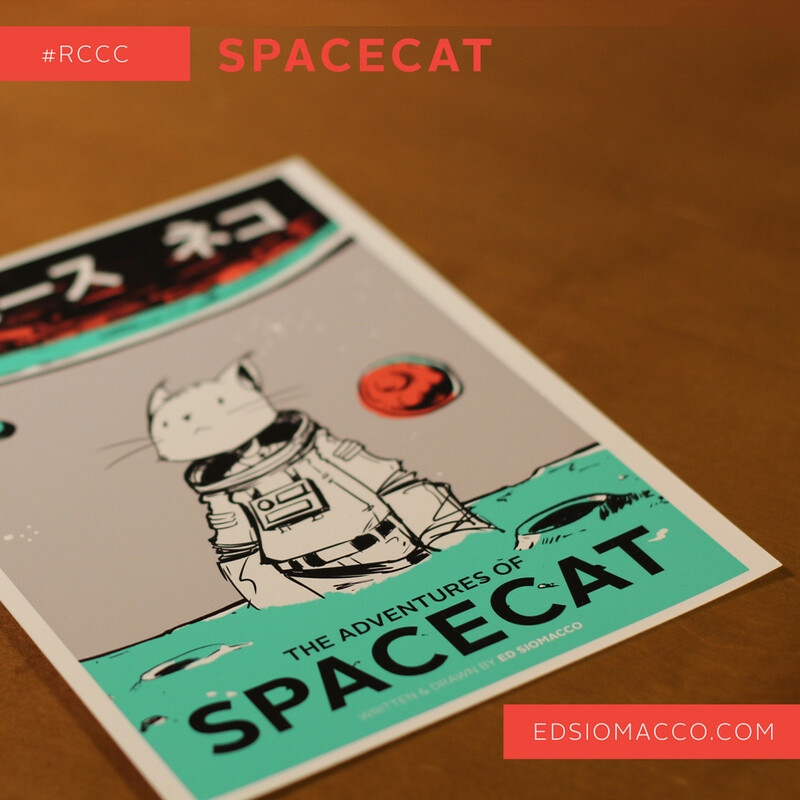 As I played the game, I liked to imagine my character SpaceCat was who was exploring the universe. I will have a handful of copies of this print at Rose City this weekend. Hi everyone! 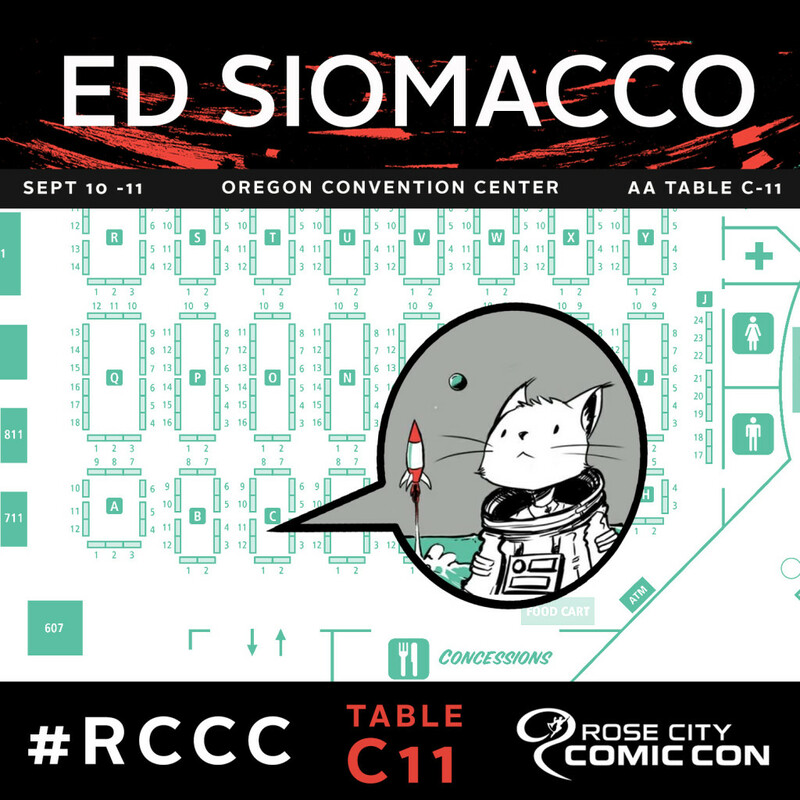 I’m so excited to be exhibiting at Emerald City Comic Con for the very first time. 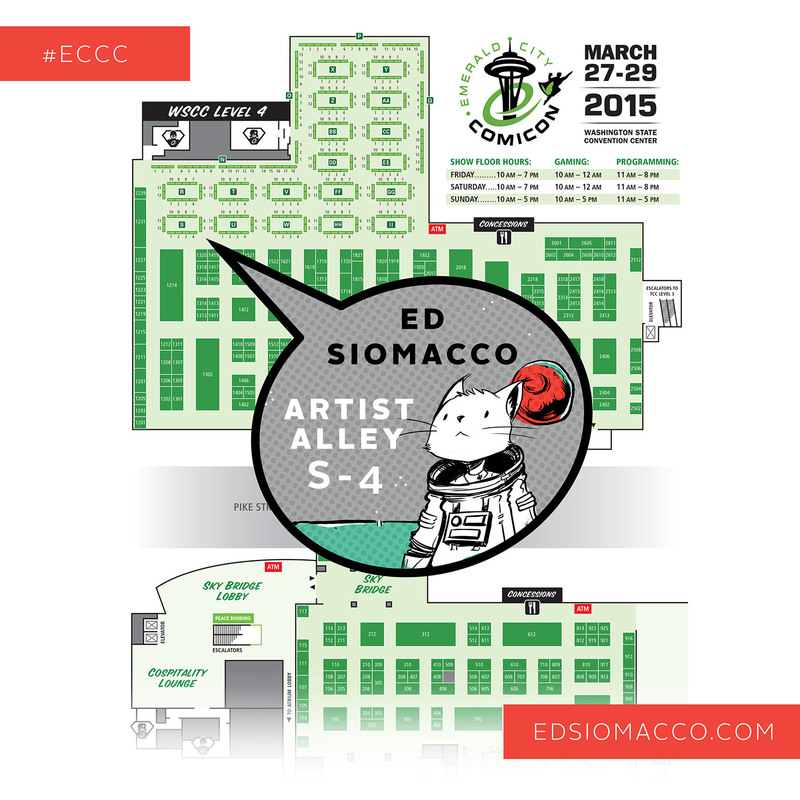 I’ll be in Artist Alley at table S-04 on March 27th through March 29th. in Seattle, WA. 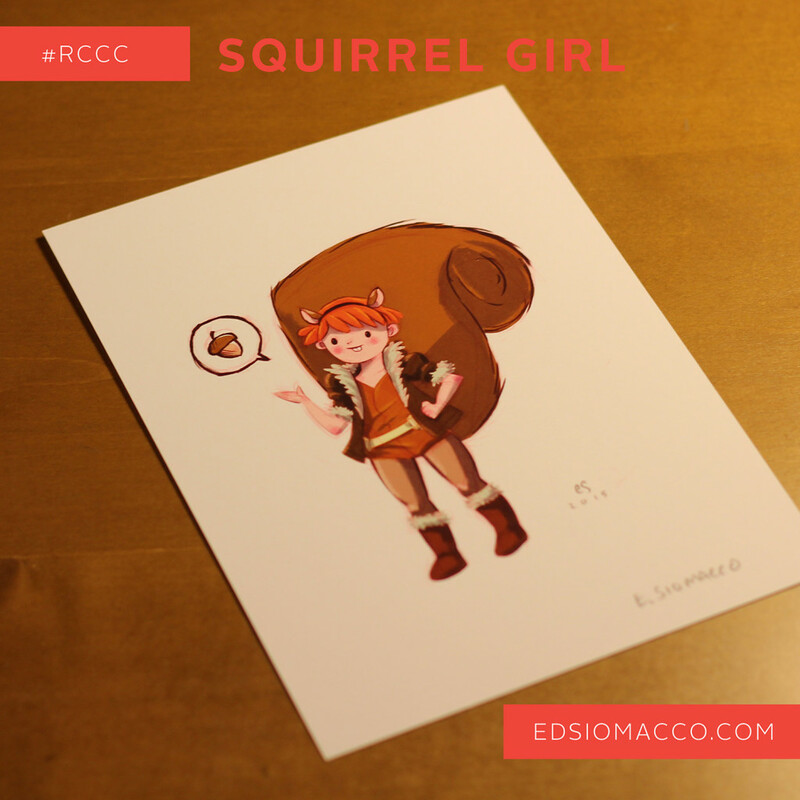 I will be bringing prints, sketchbooks, and mini comics. I will also be doing free sketches for anyone who comes by to say hello. One of my favorite things about going to shows and conventions is that I get to do free sketches for anybody and everybody that comes by. Its my way of meeting people and giving something to people so they can remember me. Please come by and ask for a free sketch. I’m bringing the last of my PLASMA VOL. 1 sketchbooks to Emerald City. PLASMA is a 28 page sketchbook of characters, creatures, and space ships. 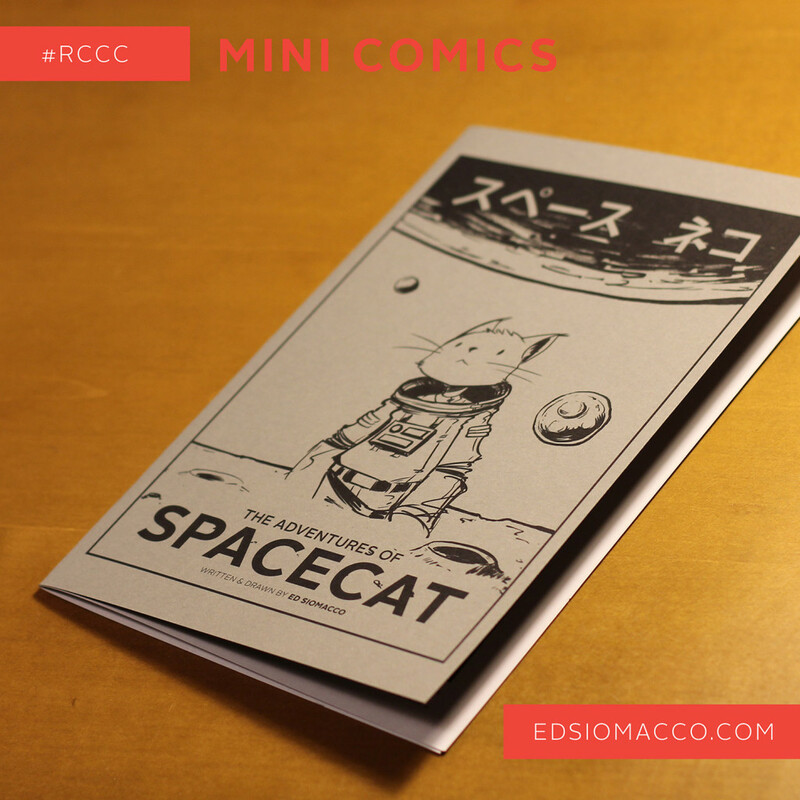 Something else I’m excited about is my ECCC Exclusive SpaceCat mini comic. 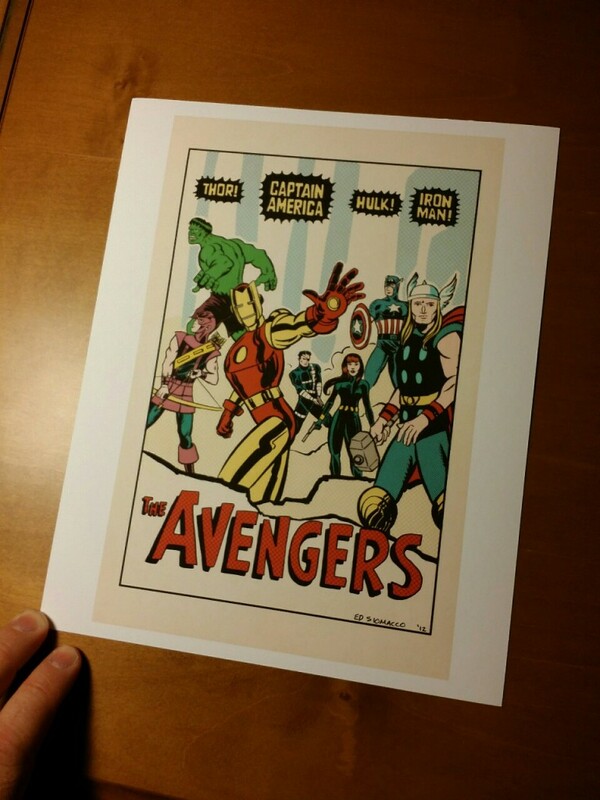 There is a limited number of these and they are only available Emerald City Comic Con. 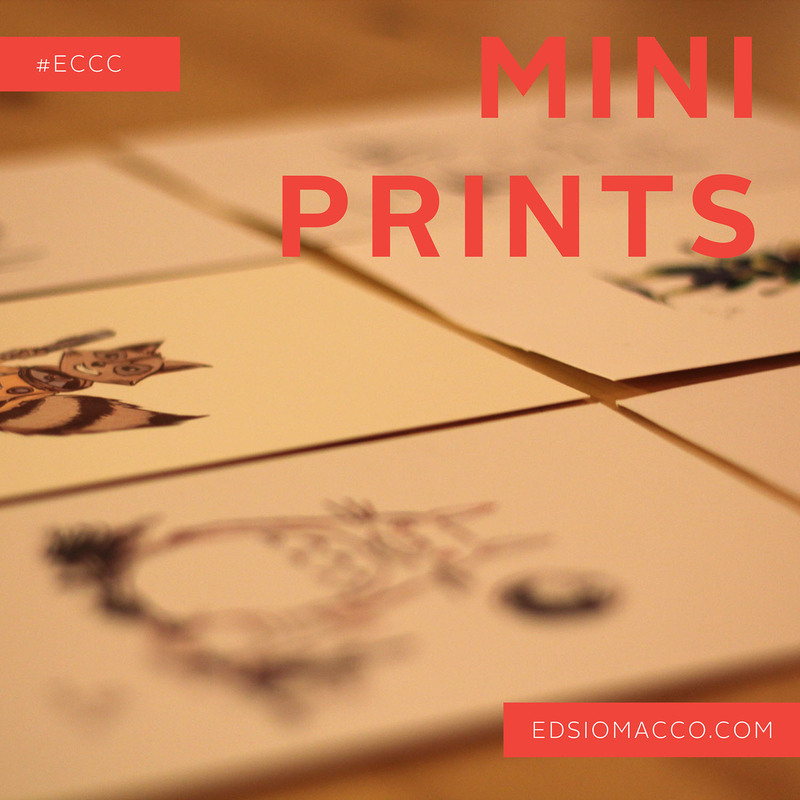 I’m excited to share with you some of my assorted mini prints this year at Emerald City. 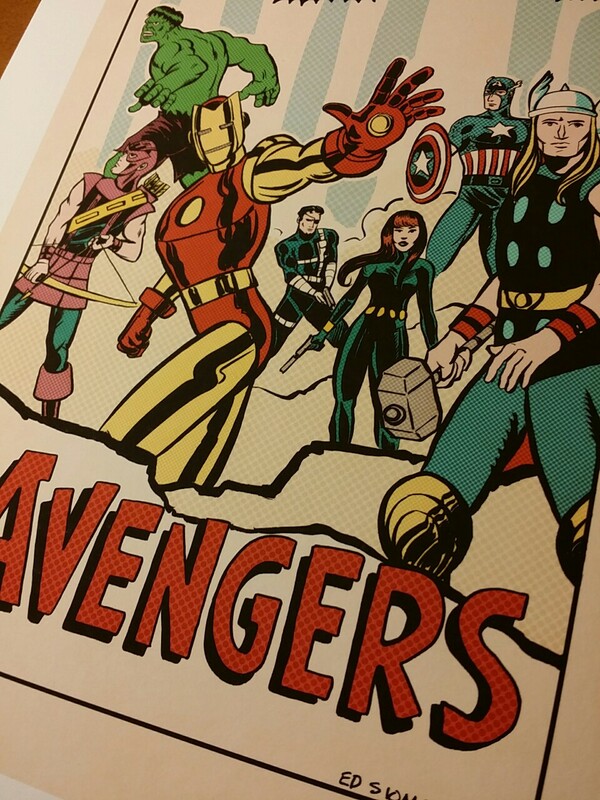 When The Avengers came out, there was a lot of talk about Jack Kirby, the creator of many of the Avengers and whether or not Jack Kirby was given enough credit for his accomplishments. 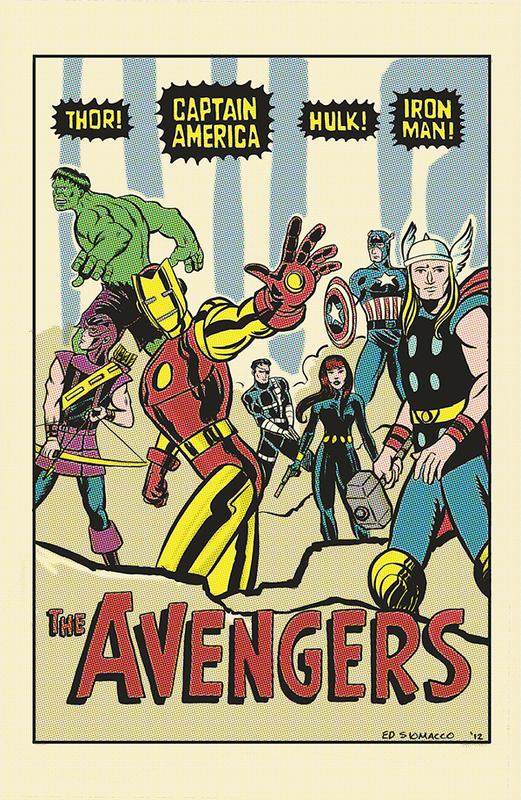 So, I drew this poster, copying the Avengers movie poster, in the style of a classic Jack Kirby cover.It ends up that is actually fooled a few folks online and ended up making its rounds on the internet. If you want to pick one up, its only available to at shows and conventions. Bobette Buster : Can You Tell your Story ? Bobette Buster is a USC professor who focuses on the art of storytelling. If you are like me and love stories and film and are fascinated by the craft, Bobette is someone you can learn a few things from. In this 20 minute video Bobette speaks about how the stories in film can help us grow and overcome adversity. She shows us how Charles Dickens, by letting us experience the horrors of child labor, helped bring healing which ultimately led to labor reform. She explains how this idea of experiencing ‘enchantment’ in film is powerful because when we see a character take a leap to overcome adversity, it gives us confidence, power, and a boldness to overcome, or persevere, through, the adversity in our own lives. Bobette also uses an example from The King’s Speech, showing how for the king’s moment of overcoming his ‘adversity’ is the moment when the king reaches out to befriend a commoner, something he never would have been able to do because of his fear of speaking. This small act is the break through moment for the character and it shows us, the viewer, how even small confrontations with adversity can move our lives forward. When characters in a film take that initial small step to overcome their adversity, that “baby step” can be the moment that breaks open that characters life and changes their life’s direction forever. An example of this is illustrated in the harmonica scene in ‘The Shawshank Redemption’. How when Red takes that bold step and plays the harmonica, even just for that second, it figuratively, and in this case, literally breaks open the prisons of life. These stories are examples for our own lives. By sharing our own stories of ‘dark nights of the soul’ and how one small thing, even if it failed, led to newness or some sense of change or freedom. Ultimately, she tells us, “all stories are about people becoming ‘truly alive’ or the ‘living dead'”. Al Pacino’s performance in The Godfather is given as an example of a moment of decision in the story that leads his character Michael Corleone toward a life of ‘living death’. In summary, what I get out of this little talk is this: Stories are about the struggle of others and good stories impute to us the strength to persevere through the struggles in our own lives. Its a great talk and I encourage anyone to watch it. It will also make you want to re-watch some classic movies with a new perspective. If you want to learn of what Bobette has to say on story you can follow her on twitter @bobettebuster and pick up her book ‘Do Story: How to tell your story so the world listens’. Also she has another great lecture called ‘The Arc of Storytelling’ over at QIdeas.org. 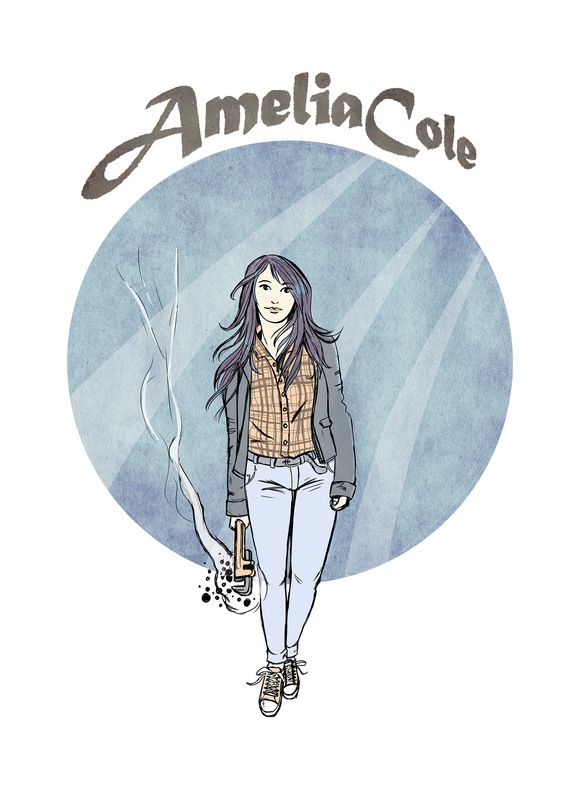 Amelia Cole is web comic written by Adam P. Knave and D.J. 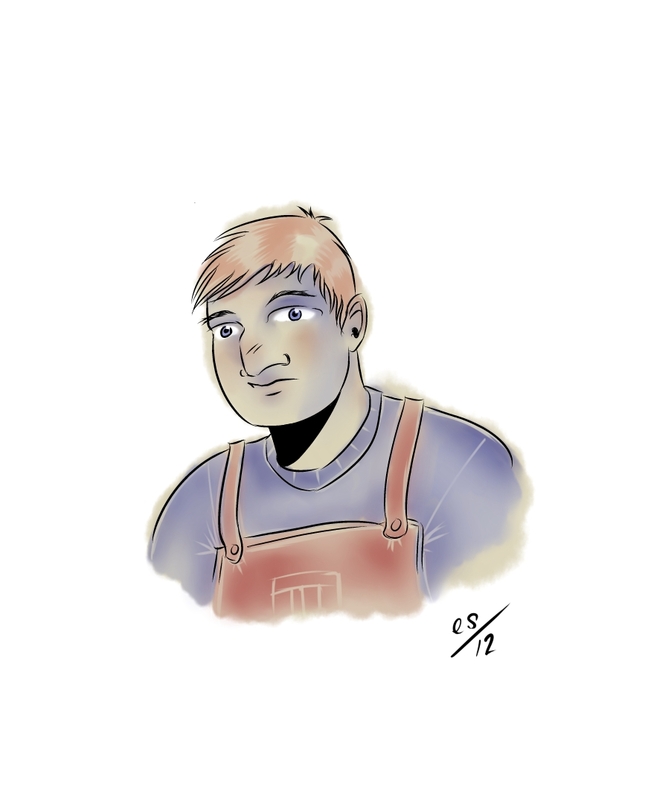 Kirkbride, and drawn by Nick Brokenshire. published by Monkeybrain Comics on the web. 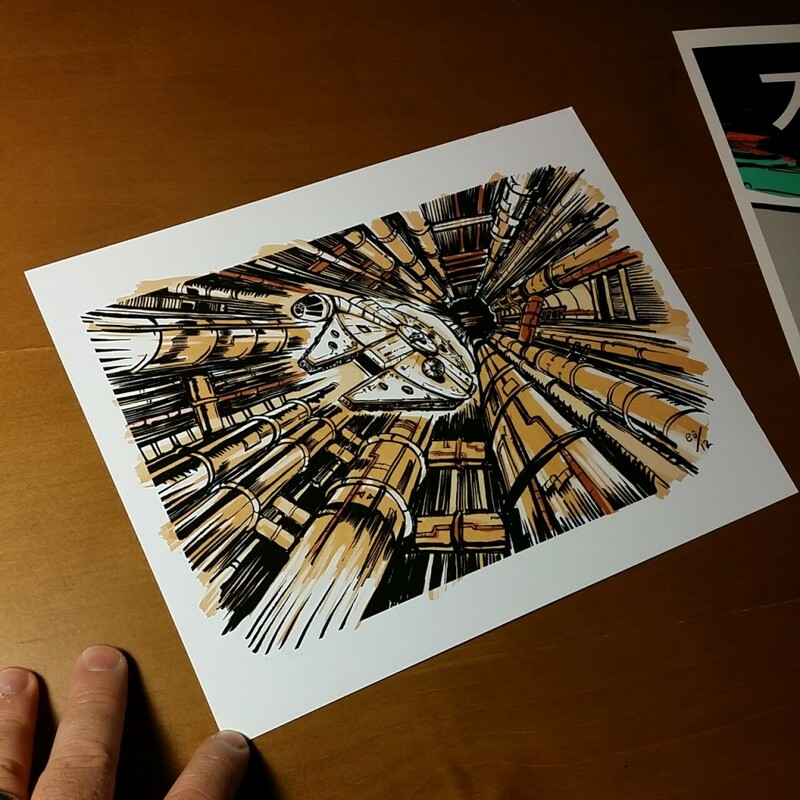 The first volume will soon be in print by IDW. 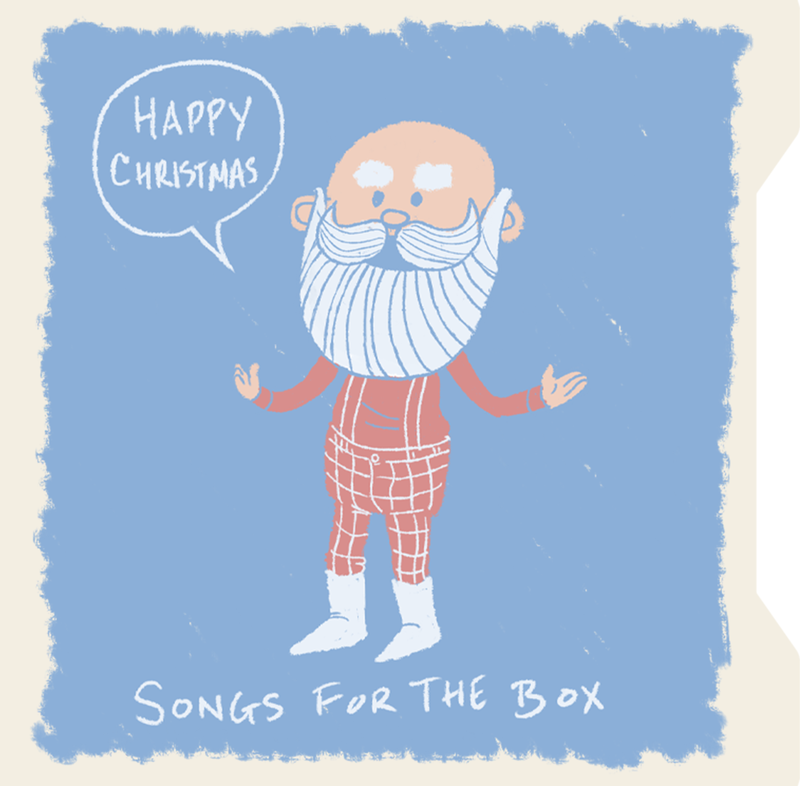 Each year I put together a CD of some my favorite songs of the year for my siblings. 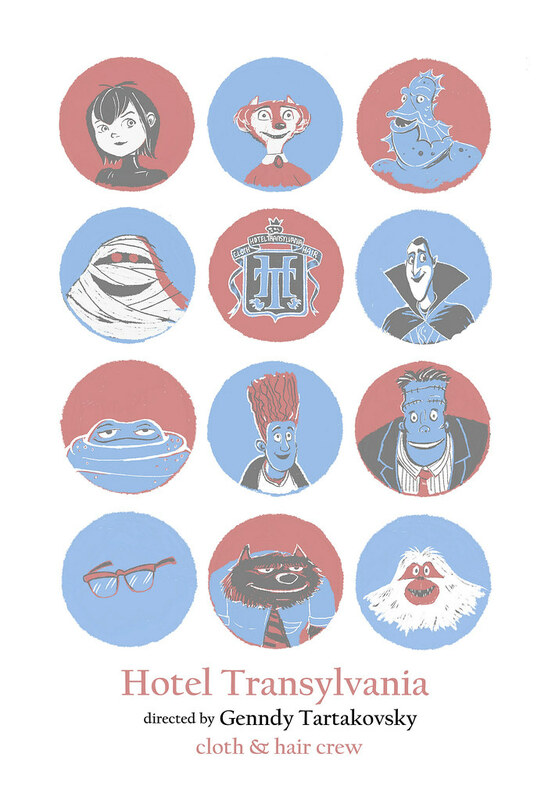 I made this for a crew print and a t-shirt design for the cloth and hair crew on Hotel Transylvania. 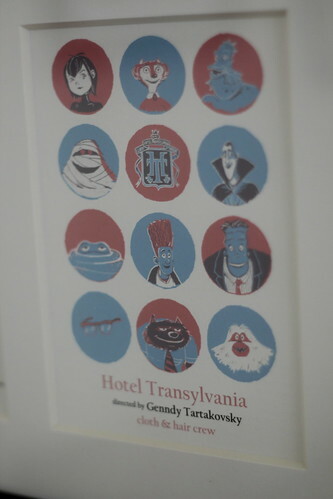 We are wrapping up the last remaining cloth and hair tasks for Hotel Transylvania. A few months back when we hit our 50 percent complete mark, I made buttons for the cloth and hair crew with this illustration on the buttons. Old presentation I did on Dir. of Photography Conrad Hall. Years ago I had to do a project on a Director of Photography for a school project. I was digging through my website and I found the webpage I made for the project. There is still a lot of cool info and video clips on Conrad Hall on the page, so I figured I would repost it here.